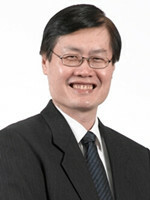 Dr Tee-Hiang Cheng received his BEng and PhD degrees in Electrical and Electronic Engineering from the University of Strathclyde in 1988 and 1992, respectively. He is a faculty member of Nanyang Technological University (NTU), where he began his academic career as a lecturer in March 1992 and was subsequently promoted to senior lecturer, associate professor, and professor. He also served on a two-year secondment, from June 2002 to June 2004, to the Institute for Infocomm Research, as Principal Research Scientist and Head of the Lightwave Department. While with NTU, Dr Cheng held the concurrent appointment of Director of Network Technology Research Centre from April 1998 to April 2002. He was Head of Communication Engineering Division in the School of Electrical & Electronic Engineering from 2005 to 2008, and has been Associate Chair(Admin) since 2008. He has been involved in a couple of major research programs in Singapore. From 1998 to 2001, he was the Research Manager of the US$15 million Singapore Advanced Research and Education Network (SingAREN) project. From February 2002 to April 2004, he led the US$10 million Optical Network Focused Interest Group (ONFIG) Optical Access Network Program. Dr Cheng has published more than 100 research papers in international refereed journals, presented about 90 papers at international conferences, and filed 4 patents. He is a co-founder of RFNet Technologies Pte Ltd, which specializes in the design of wireless and broadband networking products. He is a technical editor for the IEEE Communications Magazine and an editorial board member of the International Journal of Vehicular Technology and the Journal of Signal and Information Processing. Dr Cheng has been invited to speak at many conferences and workshops, which include giving keynote speeches at ICFCC 2010, ICCSIT 2010, 1st French-Singapore Photonics R&D Workshop 2002, and IDA Roadmap on Optical Networking 2001.